The new REC hymnal, The Book of Common Praise (2017), is now in its third printing and available for purchase. Ordering information and special instructions will be below and in the provided picture. Please note that current pricing may vary from the picture and is determined by Anglican Liturgy Press not the Reformed Episcopal Church. If you also wish to receive a PDF copy of the hymnal for use in bulletins, inserts, etc., you will need to purchase enough physical copies of the book to supply your parish. To receive a PDF, please e-mail a copy of your invoice to Chris Hoyt. The PDF includes only those pieces of music which are in the public domain (623 of the 800 pieces in the book). As with the 1940 Hymnal, any pieces of music still in copyright require permission from the copyright holder to reproduce. The accompanist editions of the new hymnal are currently sold out. The publisher will be reordering additional copies in the future. Please check their website for availability. It is important to know that when you order the hymnal, you can order individual hymnals and shipping will be calculated at $5 per hymnal. If you wish to order bulk orders, you should order them by the case (16 hymnals per case). The cost of shipping per case is $24.95 (which is about $1.50 / hymnal). To buy in bulk, please make sure you click "Shop" in the upper right of the webpage (as seen in the picture). You can then order in bulk with the product pictured on the right. Remember when buying in bulk that your quantity will be number of boxex. Example: 80 hymnals would be 5 boxes. 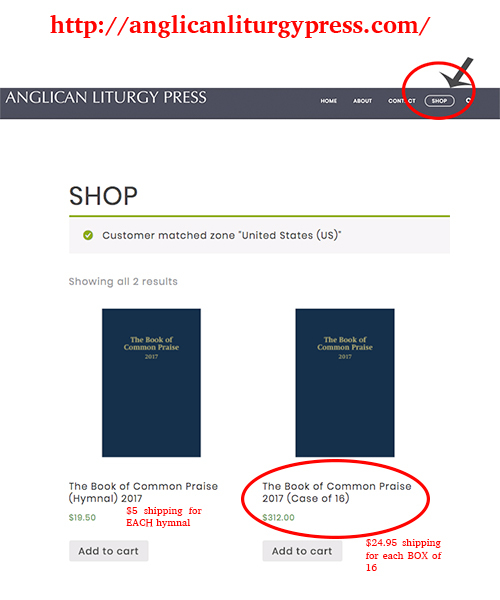 You can shop by going to anglicanliturgypress.org or by clicking the picture.